It isn’t until they arrive in New York City that Zayne realizes Agatha’s determined nose for news has earned her a few enemies. When his attempts to repay her for helping him go sadly awry, Agatha proves herself just as stubborn as Zayne. Everyone else may think them a match, but nothing could be further from the truth–until Agatha finds herself in real trouble. Have these two stubborn, too-smart-for-their-own-good people been meant for each other all along? If there’s another book in this series, I’m hoping that it revolves around Agatha, one of Felicia’s best friends in ‘A Talent for Trouble’. In the book, her long-time crush is getting married to another person, and she’s just getting over it. While I’m hoping that Zayne is the main male lead for her – they seem so perfect t together! – I’ll be fine as long as she finds someone in the next book. Of course, I can’t really argue with myself, so I settled back into the book, content as a little pig eating chalk (it’s a reference to the story…I’m not actually calling myself a pig). To keep it short, Matilda is an adorable little pig who likes eating chalk and candy from the streets, hates the word ‘pig’, and ‘ham’, and will run snorting out of your home if you serve lamb (or ham). She’s also a great personal bodyguard. Can I have a Matilda please? The pig wasn’t the only adorable character in the book, however: Zeke and Agatha were cute in their own ways, Zeke because he knew almost absolutely nothing when it came to women, and Agatha because of her tendency to find herself in a troubling situation, as well as her tendency to annoy the heck out of everyone while still be loved by them. As stated in the novel many, MANY times, they really were perfect for each other. The plot was a bit more of a “best friend turns true love” type of story, and while they usually don’t appeal to me in contemporary romances, they work well in historical fiction for some reason. It was also refreshing that the heroine was a wanted woman, as in someone wanted her head. One of the things I found funniest about the novel is the fact that Agatha was her own, and Zeke’s, knight in shining armor. For you feminists out there, you may really enjoy this book since it totally disintegrates the idea that men are the stronger species, and that they must protect their women. 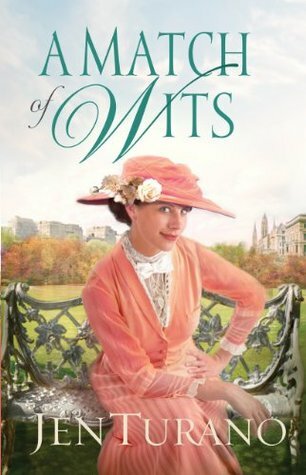 ‘A Match of Wits’ is a great new addition to the ‘Ladies of Distinction’ series, and reading this book has only convinced me more that I must catch up on the first two books in the series. I’m not sure whether or not this will be the last ‘Ladies of Distinction’ book, but if it’s not, I only hope that the next book will be centered around a plot that differs from this and the last novel. Overall though, fans of the series will be delighted at Agatha’s story, and though the preaching about God was a bit less than normal (Zeke refused to pray to God when it seemed his leg would never work again, then when he was told his leg would heal perfectly, he had no qualms about prayer…not cool, dude), the storyline was almost exactly what I’d expected it to be. Rating: 3 1/2 little fishies!